There are some situations that can cause there to be a mismatch between surface elevations between tiles. This can become apparent in the vicinity of waterbody breaklines where a tile covers the water but only overlaps with a single shoreline. In this scenario, the surface generation process cannot consider the influence of breaklines on the opposite side of the water body. This can prevent the seamless transition between tiles. If the “Cookie Cut by Polygons” option is used for the surface generation, check the “Apply Buffer to Polygons” box and specify a distance in Map Units. This distance should be far enough from the edge of the polygon to reach the adjacent breaklines or additional point data. This will allow the process to consider breaklines outside the tile being processed. In many cases, users do not wish to have resultant output tiles larger than the desired polygons, so one may use a project setting to accomplish the same task. It is best to run this only for the tiles required as it will slow down the overall processing, and isn’t necessary where tiles have a good amount of data around the tile boundary. 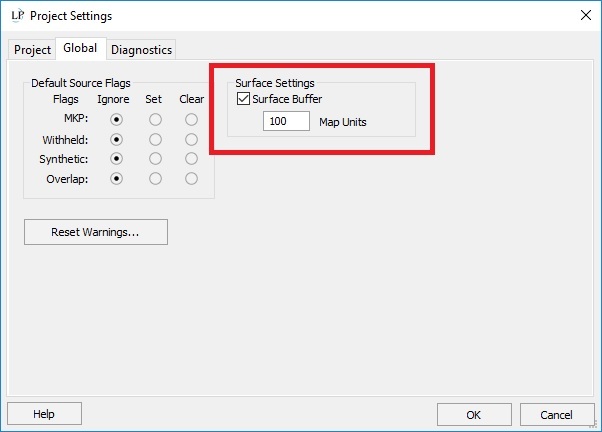 Navigate to the File -> Project Settings -> Global tab and check the “Surface Buffer” box. Specify a distance in Map Units, which has a similar effect as in Solution 1, but leaves the resultant output matching the provided polygon instead of being expanded. This entry was posted in LP360 Tools, Tips and Workflows and tagged Apply Buffer, buffer, by polygon, Cookie Cut, Project Settings, Surface Buffer, Surface Settings.